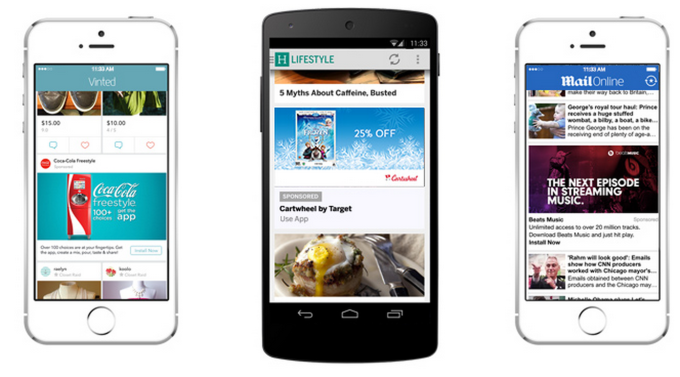 Twinpine Blog: What is Mobile Advertising? More than You Think! What is Mobile Advertising? More than You Think! When many people hear the words “mobile advertising,” they probably think of mobile banner ads, or perhaps mobile search results. But the reality of mobile advertising is that the industry is expanding to encompass many different formats and interactive experiences. Mobile advertising has come a long way from the days when a “mobile ad” was just a small banner to tap. Today, mobile advertising is becoming a more crucial part of the marketing mix for app publishers & brands of all sizes, as companies develop more sophisticated methods to engage with consumers, influence their buying behavior, and even complete the sale via mobile device. Local mobile advertising: In the early days of mobile advertising, most mobile ads were just slimmed down versions of online display ads that would appear on a desktop screen. But as the mobile marketing field has evolved, there are now many sophisticated and precise methods to target users based on their geographic location. Being able to target people on a very local level while you know that they are using their phone to search (i.e. likely to be out and about) is very powerful. As this technology improves, local businesses will have increasing control over getting their offer in front of consumers just at the right time to engage in an offline interaction or purchase (e.g. someone searching for pizza from their phone in a particular city). This brings a new level of relevance to the mobile advertising offers – you can offer consumers what they need, when they need it, where they need it. 2. Mobile advertising formats expanding: Mobile advertising formats are becoming more dynamic and complex to match the expanding capabilities of smartphones. Instead of static banner ads, more mobile advertising now includes video and interstitial screens. Some mobile advertising campaigns have even used the vibrating capabilities of a smartphone to help convey a message – the Discovery Channel promoted their “Storm Chasers” show with mobile ads that took over the speakers and made the phone vibrate to simulate the sounds and effects of a storm. In addition to new technology making ads more engaging with video and audio, many big brands are using mobile advertising to create more interactive experiences. For example, McDonald’s ran a mobile advertising campaign offering people some free “smart advice” from a wise old man. After tapping the banner ad, users can ask whatever questions they want, and they hear an answer via audio from their smartphone. For an even more ambitious interactive ad campaign, Coke and Google teamed up to create a massive mobile ad campaign to “Buy the World a Coke” (inspired by the classic Coke ad from 1971). In the Coca-Cola mobile ad campaign, people are asked (via mobile ad) if they would like to send a free Coke to someone else around the world. Then the free coke is given away at a specially outfitted Coca-Cola vending machine in cities in South America, Africa and elsewhere, and the recipient can record a video greeting thanking the sender for the free coke. The whole campaign is optimized for social media – so people can “give away” a free Coke, and then share the friendly message from a stranger on the other side of the world. These examples are part of a broader trend spotlighted in a recent study by the Mojiva mobile ad network , which predicts that rich media mobile advertising will grow 365% between 2012 and 2016. 3. Mobile commerce and shopping becoming a reality: One of the early skeptical attitudes toward mobile advertising was that “people don’t want to buy things from their phones.” But in the past few years, consumers have become more comfortable using their smartphones and mobile devices to shop and complete purchases. According to the Mojiva study, mobile shopping and m-commerce are the fastest-growing categories of mobile ads, growing from 4% to 11% of that network’s total ad impressions. Mobile ads have gone from being just a smaller version of online display ads to being a unique medium of communication that can help influence and drive the buying process. Beyond just creating brand awareness, mobile ads are now creating unique location-based and social media-friendly interactive experiences that can deepen a customer’s relationship with a brand, or even close a sale. As technology continues to improve, as people become more comfortable shopping and buying from their mobile devices, and as companies become more sophisticated about reaching consumers where and when they want to receive offers, we expect that mobile advertising’s role will continue to expand in exciting new directions.